If you’re new to real estate investing, you may be feeling overwhelmed and wondering how the heck to figure out which properties to buy. Optimally, you’d like to get a handle on which investments will be the most profitable before jumping in—and you can! Calculating the cap rate, or capitalization rate, is hands down the best place to start, particularly for rental or commercial property investors. The definition of cap rate is the annual return from operations that an investor would expect to receive for a certain asset in a specific market at the current time, if the asset were to be purchased for all cash. While there are several ways to estimate the value of an investment property, many popular options fall short, failing to consider important things like capital expenses, deferred maintenance, market factors, or debt terms. This is why the cap rate should be one of your main rental analysis tools. So, you’re at a local real estate meetup, and someone presents you with an off-market deal. “This won’t last long. It’s priced to sell. You better jump on it!” they say. It sounds great. But is it really a good deal? Here’s where you begin your assessment. You can also turn this formula around to calculate any of the other variables. Want to know what you should pay for a property? Curious what your net income will be? That is a 5 percent cap rate. This would be considered a high price and low cap rate by most historical standards for most assets in most markets. You may decide that you won’t pay $600,000. You instead determine that you want to make a 7 percent annual return (aka cap rate), and you’re buying for cash. Notice that the move from a 5 percent cap rate to a 7 percent cap rate is a wide swing in price, from $600,000 to $428,571. The denominator in this equation causes a large fluctuation in the outcome. In other words, a small change in cap rate can cause a significant change in value. Also note that just because there is $30,000 in net operating income doesn’t mean that you will take home that much. There may be capital expenses and other items to consider—most notably debt service if you take out a loan. The principal and interest on a loan of this size could be a few thousand per month, which could eat up most of your cash flow. But if that’s true, why would you use debt anyway? Well, one might choose to go that route because the use of leverage could allow him or her to buy more property for the same amount of cash. And it could multiply the appreciation received on an asset, as well. Though I’ve been a commercial real estate investor for years, I’m still at times surprised when I calculate the power of debt with regard to increasing the value of equity in a project. Through the late 1990s, investors looked at about 10 percent as the benchmark cap rate for commercial assets as a whole. With cap rates for multifamily and other real estate investments running from 4 percent to 7 percent these days, 10 percent seems like a distant memory. 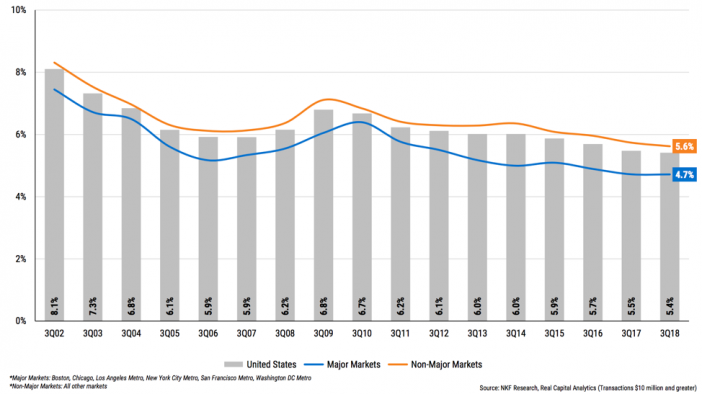 The massive influx of capital chasing multifamily deals has driven cap rates down to historically low levels, meaning prices are at historically high levels. You will become familiar with what’s a good or bad local cap rate once you begin shopping for and evaluating deals. Below is a chart showing large multifamily cap rates from 2002 to 2018. Keep in mind this is for large transactions, and these big players can often endure more compressed cap rates than you will want to consider. The averages above include newer, more stabilized assets than you may be looking to buy, which likely means you will be taking on more risk, more potential maintenance and repairs, and a chance for higher vacancies. All this translates into a higher cap rate (lower price) for your transaction. In your evaluations, you may also quickly realize that broker estimates of cap rates differ from actual cap rates. Brokers sometimes base the cap rate off of a pro forma (theoretical) operating statement, which means they calculate what the property will be making once you buy it (for an inflated price and implement your magnificent marketing and management changes). You can draw your own conclusions, but I recommend that you rely heavily on past performance (what is) over future projections (what could be). It’s easy to be fooled in this regard. Be careful. That said, if you have definitive changes that you can make to an asset to quickly improve its income, that can be an offsetting factor. For example, my firm Wellings Capital acquired a 125-unit townhome community in 2017. We knew that the water and sewer expenses were more than 100 percent too high. Through our due diligence process, we discovered the culprits. To improve the situation, we planned to install water meters on individual units, fix the leaks (stemming from old toilet flappers and pools), then pass the water bills back to the tenants. We believed this would cut our water bill in half, adding about 10 percent to our bottom-line income. We took these steps after the acquisition, and turns out we were right. As I mentioned previously, there are several other ways to evaluate properties prior to investing. I’ll briefly describe three of the most common and explain some of their shortcomings. Price per unit. This option is popular for its simplicity. The average newbie investor can quickly compare apartments at $50,000 per unit to others at $90,000. And many investors have an idea of the cost of newly built apartments (typically over $100,000 per unit all-in). But this method fails to consider several of the most important factors in real estate investing, such as revenue, expenses, deferred maintenance, and other capital expense needs. The neighborhood and the economy are not part of the equation either. Overall, this is a poor way to evaluate the value of a multifamily property. Is $50,000 per unit (aka per door) a good deal in your hometown? Is $150,000 per door a bad deal? It’s possible that $50,000 is a bad deal, or $150,000 is a great deal! There’s much more you need to know before making that judgment. Gross rent multiplier (GRM). When I first got into real estate investing, I heard that this was a good method of evaluating rental property value. The GRM is simply the price of the property divided by the annual gross rent. So, let’s say a 30-unit multifamily property was priced at $1.5 million and the gross annual rent was $243,000. A broker may tell you this is a good deal because the “normal” GRM in your market is 7 or above. But not so fast! The GRM fails to consider expenses, deferred maintenance, market factors (like supply and demand), and the property type. The GRM also assumes that you know the accurate gross income of this property and the other comparable properties in the market. Realistically, it’s difficult to be certain. Brokers will often try to use the gross potential rent at full occupancy with no concessions, too. However, any number other than the actual gross rent renders the ratio meaningless. I’m not a fan of the GRM. One percent rule. I heard about this one before I ever considered buying a property. This rule of thumb states that the per unit rent should be at least 1 percent of the cost per unit. A property priced at $75,000 per unit should therefore be renting for at least $750 per unit. This is perhaps the most well-known metric on Main Street. But like those above, I wouldn’t use it (except as a preliminary guesstimate when initially hearing about a property that’s for sale). The 1 percent rule can indicate that the property is priced in line with revenue projections—but not much more. This ratio tells you nothing about operating expenses, deferred maintenance, capital expenses needed, or debt terms. It will not help you figure out if this will be a good cash-flowing property for you. So, as you can see, all of these are somewhat faulty measuring sticks. This is why I propose that you adopt the use of the cap rate one of your main analysis tools. It accounts for both revenue and expenses. It reflects the supply and demand for a particular asset type in a certain location at a specific time. It reflects the asset grade (new Class A rates are often about a point below Class B). It can have a connection to the interest rate on debt. It is a standard metric that is widely used by most operators, investors, and brokers. There’s a lot to say about cap rate. This could definitely be a much longer post. So, to conclude, I’ll briefly address a few common questions about cap rates. Q: Could the cap rate get so low that the asset won’t cash flow? A: Beware: this could happen—especially when using debt and when competing against the big boys in primary cities. You can calculate this yourself by factoring in the net cash flow including debt service, deferred maintenance, and necessary capital improvements. Q: Why would a REIT or life insurance company buy an asset at a 3 to 4 percent cap rate? A: Some institutional investors buy for cash or with low debt, and they love the stability and predictability of buying in primary or gateway cities like New York, Boston, L.A., and San Francisco. These assets have additional subjective value due to their location and steady demand. These buyers can endure low returns in exchange for stability and likely appreciation. I recommend that you don’t play in their sandbox. Q: Is a high cap rate always a good deal? A: If you hear about the sale of a property at a 10-cap, it may sound like a screaming deal. But you get what you pay for. There is likely a reason that it is selling so cheaply. Perhaps the operating statement is misrepresented. Perhaps it is a C- or D-class property in a high-crime area. Maybe there are environmental hazards or other reasons the seller wants to dump it quickly. Buyer beware! Q: I heard the cap rate is what it is. You can affect income, but you can’t affect the cap rate in the value formula (Income / Cap Rate = Value). Is that true? A: While this is often true, there are tactics that can be used to compress the cap rates of certain asset types in certain situations. Our Wellings Capital funds are invested with operators who have strategies and proven track records of buying assets (like self-storage facilities) from mom and pop owners; making significant enhancements to marketing, operations, and resulting income; and selling to REITs or other institutional buyers. By doing this, these operators have been able to achieve significant cap rate compression in the sale of these assets. This results in substantial asset appreciation and almost unbelievable equity growth in conjunction with the careful use of leverage. Do you understand cap rates better than you did 10 minutes ago? Submit your cap rate questions or comments below. Cap rate investing below your cost of money is gambling. Anyone concur ? Enjoyed this article; only wish RE agents and broker in the Northwest read it also. Paul, great article, very clearly explained. For my purposes I also include an allowance for vacancy and repairs into my cap rate so I can an even more comprehensive picture of expected net cash flow. @Gorman4, I think it really comes down to investing for cash flow or appreciation and your risk tolerance. If the cap rate is below cost of money then you’re banking on appreciation. I would say it’s “speculative” because it’s assuming someone later will be willing to pay more for your property than you paid for it today. Probably yes, if later is long enough, but who knows? I treat cap rate like a stock dividend and appreciation like stock price price gains. I don’t look at CoC or any of the other metrics because I think they are two separate decisions: (1) rate of net cash flow, and (2) how you fund it. Back to the stock comparison, it’s like having a margin account, some do because they think they can make money off the spread of the interest rate versus traditional market gains. The wider the negative spread between cap rate and interest rate, the more speculative on appreciation and the higher the risk. You then need to look at your ability to absorb risk. If your only ability to fund the risk is out of the rental income then I’d say that a cap rate below interest is indeed gambling. Personally, as a discipline I only purchase where the cap rate is higher than my cost of money because, while I could fund it out of my day job, my goal is to build a self-sustaining business for retirement passive income and in retirement I won’t have a day job to fund the risk. To your point about Northwest, I live in Seattle and have been looking for purchases here but so far I can’t make my model work, but that doesn’t seem to be discouraging others. Really useful article. thank you! I’ve come across two types of cap rate formula with either purschase price or current market value as a denominator. What type of formula is more preferable? Well done Paul. Very knowledgeable and understandable for most folks….I like the way to give the “good, bad and ugly” of any formula. You can manipulate just about anything. Be honest with yourself ! Very good article Paul. Good info. Once again Paul Moore has authored an excellent article. Very informative and well done my friend! I really appreciate the frank presentation of this subject, and how you point out the reality behind the rules of thumb I’ve heard of. Great article, lots for me to learn here. Thank you! @MEG ROSS I feel the same. I just wanted to thank Paul for the great article. I feel this is a straight-forward, non-biased article especially helpful for newbies like me. Wow. Great break down. Gave me much more of an understanding and provided me with a great tool to question certain deals that are brought to me from potential agents I am using.